Nothing draws you into a book like a great cover. 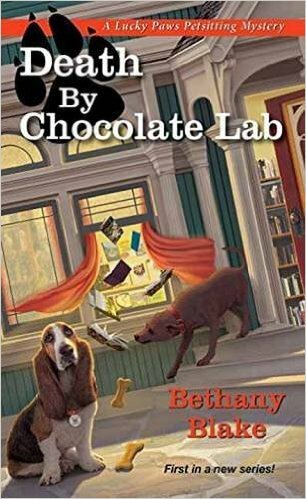 When I saw the cover to Bethany Blake’s new book, Death by Chocolate Lab, I knew it was one I wanted to read. Then I read the book summary. I was hooked. It was just too up my ally to pass up. And I’m very glad I gave it a try. This is a fun, lighthearted read, and it endeared me to Bethany Blake and the Lucky Paws Pet Sitting Mystery Series for books to come. Daphne Templeton is a pet-sitting free spirit living in her hometown of Sylvan Creek. When her sister Piper’s ex-boyfriend turns up dead on her property, Daphne is determined to clear her sister’s name. Even if it means aggravating the town’s newest mysterious resident, the handsome Detective Jonathan Black. This was a fun book. I liked the relationship between the two sisters, Daphne and Piper. They are opposites, yet care for each other, and you can tell their relationship has potential for many entertaining ups and downs in future books. If you enjoy Krista Davis’ Paws & Claws Mystery Series, then this would be a good book for you. If you are looking for an entertaining read that includes lots of furry friends and interesting characters, then Death by Chocolate Lab is one for you. Want to win a free copy of this book? Enter below to win one of two print copies that author, Bethany Blake is giving away. Good luck! Thank you so much for hosting part of my blog tour on your site. I’m so glad you enjoyed the book! I requested that my library purchase a copy (which they did). I loved it and am looking forward to the next in the series. I am a professional pet sitter (and a rescue person) and I enjoyed that connection.